Criminology explores the age-old question of why people commit crime. As an academic field, it is multidisciplinary, combining the study of sociology, psychology, biology, political science, and law. Utilizing multiple disciplines allows for a broad lens of investigation of the roles that social class, family, lif e-course events, discrimination, group affiliation, policing, law and courts, and corrections play in determining how a society defines crime, contributes to or deters criminal behavior, and responds to and treats victims and offenders. Criminologists have a wide variety of career paths from which to choose. Those more interested in the sociological aspects may be interested in positions addressing social reform and involvement in programs improving social conditions within high-crime communities. A criminologist focusing on the psychological underpinnings of criminal behavior may pursue positions involved in victim advocacy, prevention programs for youth, or rehabilitation programs for offenders. Those interested in the criminal justice system may pursue a number of positions including, careers within law enforcement, the courts, or corrections. Many times students find the difference between the study of criminology and criminal justice confusing. This is not surprising as there is a fair amount of overlap and interconnection between them. 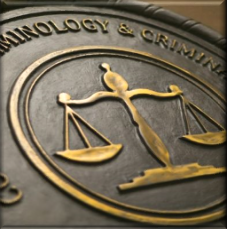 Criminology seeks to determine the causes of criminal behavior by considering social and psychological factors and the effects of how we address criminal behavior within the criminal justice system. Criminal justice; however, focuses primarily on the procedures and processes of the criminal justice system. Our program offers a focus on criminology, but there are many courses exploring the criminal justice system as well. The Comprehensive Bachelor of Science in Criminology (B.S.) offers students the opportunity for immersion in our required criminology core while emphasizing one of three different areas of choice: diversity, the adult system, and the juvenile justice system. Each emphasis allows students to specialize in one of these fields and tailor classes within that emphasis to fit their interest beyond the core courses within the program. The completion of a minor is not required with the major, but student’s may add one if they wish. The minor in Criminology and Criminal Justice allows students to supplement their degree programs and engage in the study of both aspects of crime and the system that addresses its effects. For more information on the Criminology program contact Ms. Tabor or us at DH Northwest.